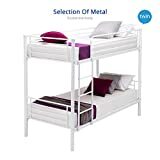 The best thing about metal bunk beds is that they are sturdy and long lasting which makes them ideal for kids as well as adults. They are resistant to breakage and normal wear and tear is also something that these metal bunk beds can resist quite well. 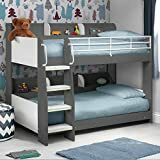 Below are some of the most popular metal bunk beds for kids as well as adults. We offer a FREE delivery to mainland England, Scotland and Wales. Sorry no Offshore delivery service available. STRICTLY BEDS AND BUNKS offer a NO QUIBBBLE returns service, in the unlikely event you are not satisfied we will arrange to collect the order FREE OF CHARGE. Our delivery service includes an email confirming the exact delivery day with an AM or PM estimate. Make sure we are in the BUY BOX for this service.Our driver will ring 30mins before on the day of delivery. 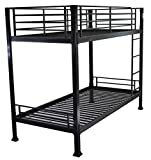 Modern black metal bunk bed - SUPER STURY, made to EN747 British Standards. This is a heavy duty product designed for adults, can be used in contract locations. IMPORTANT- This model does not use any bolts during assembly, super easy !! We offer a FREE delivery to mainland England, Scotland and Wales. Sorry no Offshore delivery service available. We operate a NO QUIBBBLE returns service, subject to conditions. Our delivery service includes an email confirming the exact delivery day with an AM or PM estimate. Our driver will ring 30mins before on the day of delivery. RANGE NAME: Pandora Heavy Duty Bunk Bed . This is a heavy duty bunk bed. The ladder can go to the left or right of the bed. The product is sold for easy home assembly. 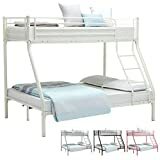 NOTE: This model is available with ALL FRONT ladders, type in Amazon search Triad Triple Bunk Bed. The top bunk is a standard 3ft Single bed, the bottom bunk is a full size 4ft6 double bed. Perfect if you need to save space. The metal tubular rails give this bunk a contemporary, modern look. The ladder is fixed to the right hand side.